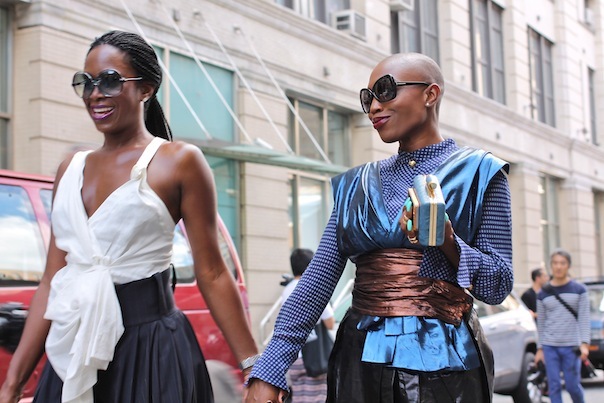 Men aren’t the only stylish ones wandering during New York Fashion Week. Since I was shooting well dressed Latinas for Latina magazine, I also snapped several stylish women I spotted. Here are my favorites, with Eva Chen from Lucky sporting a smiley face hardshell clutch that I kind of want to put my electronics in for when I travel. Posted on September 12, 2014, in Fashion, Fashion Week, Street Style and tagged Fashion, Fashion Week, New York, NYFW, SS15, Street Style, Style, Women, Women's Fashion. Bookmark the permalink. Leave a comment.